Wednesday, Mar. 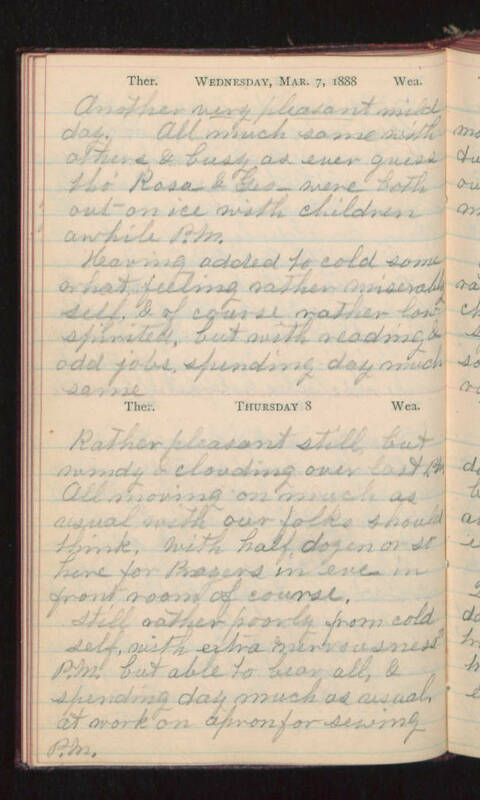 7, 1888 Another very pleasant mild day. All much same with others & busy as ever guess tho' Rosa & Geo - were both out on ice with children awhile P.M. (Heaving?) added to cold some what feeling rather miserably self, & of course rather low spirited, but with reading & odd jobs, spending day much same. Thursday 8 Rather pleasant still, but windy & cloudy over last P.M. All moving on much as usual with our folks should think, with half dozen or so here for Prayers in eve in front room of course. Still rather poorly from cold self, with extra nervousness P.M. but able to bear all, & spending day much as usual at work on apron for sewing P.M.